The Giant's Causeway Coast is considered some of the most spectacular coastline in Europe - wide, sandy beaches washed by Atlantic rollers, neat fishing harbours nestling between craggy cliffs and grassy dunes supporting a wealth of wildlife. The area is a golfer's paradise, with eight courses (including Royal Portrush) within easy driving range; for anglers, the River Bush is within casting distance of the hotel gardens. The welcoming glow of their five turf fires is just one of many features that give this historic inn its unique and intriguing character. The oak-beamed loft is the gateway to the Mill House and 41 spacious, cottage-style bedrooms, each with private sitting room area, on the banks of the River Bush. There is a secret room - if you can find it! - and in the bar, still lit by gaslight, you can treat yourself to a glass of 25-year-old Bushmills malt whiskey from the hotel's private cask while anticipating the pleasures of the Taste of Ulster Restaurant. Within the restaurant's whitewashed walls and intimate snugs you can enjoy excellent, freshly prepared dishes and expertly chosen wines. 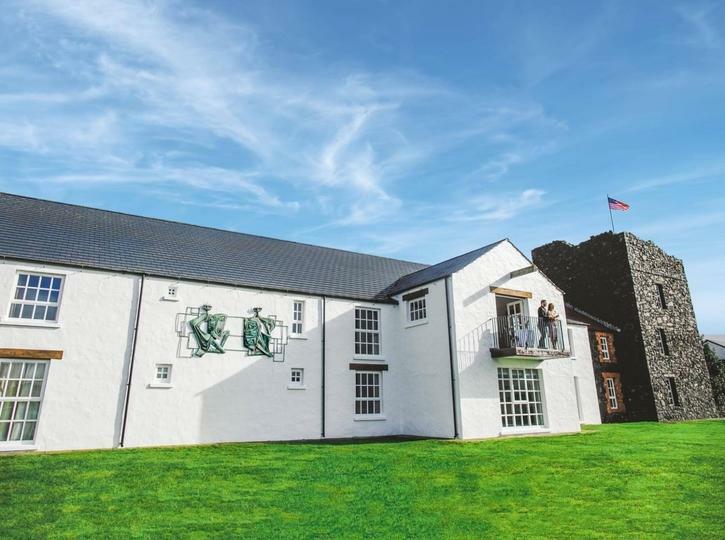 The inn epitomises the true spirit of Ulster hospitality, and is regularly featured by television presenters and travel writers from all over the world.